We recommend Hotel Benczúr to all the travellers who wish to enjoy a quiet location and elegant surroundings just a few minutes away from the World Heritage site Andrássy Avenue and the Heroes' Square. We are situated in Benczúr utca which runs parallel with the World Heritage listed Andrássy út in the inner part of the City of Budapest. The hotel is set in elegant surroundings, providing easy access and yet away from the noise of the city. Our trained and attentive staff will ensure that you have the best possible stay here. Our hotel has 90 standard and 58 superior rooms, 4 superior apartments and 8 suites. They are all to a high standard with TV, telephone, minibar and some with air-conditioning. Our superior wing is non-smoking, fully air-conditioned, and anti-allergenic rooms have also been added. Your comfort is further supported by room service, a safe, locker, parking space and laundry, your relaxation is ensured with a restaurant, cafe, internet corner and an atmospheric beer garden. Our reception will assist you with a full range of services organising programs enabling you to enjoy your leisure time to the full. Your pets are also a welcomed "guest" at our hotel. • Half board is available at 14 EUR per person. • The hotel's own parking lot is available for the guests at 12 EUR per car per day. The reservation cannot be modified or deleted. The provided credit card will be charged with the total sum of stay on the booking day. Book maximum 2 days before your arrival and get 10 % discount! Standard (***) room with a queen-size bed or separate beds, bathroom with bath, tv, phone, minibar, WiFi (extra cost). smoking- and non-smoking rooms. Pets welcome. Some of the rooms are air-conditioned. 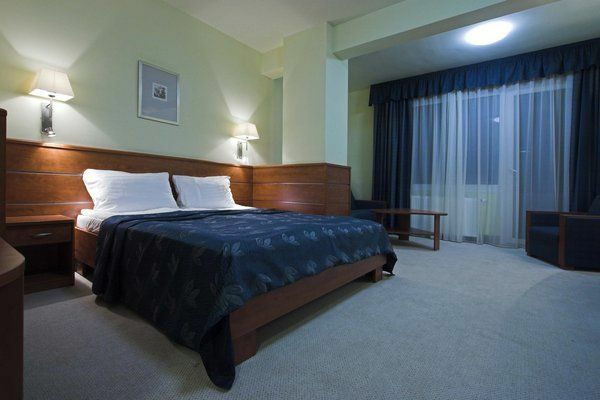 Standard (***) room with a queen-size bed and an extra bed, bathroom with bath, tv, phone, minibar, WiFi (extra cost). Smoking- and non-smoking rooms. Pets welcome. Some of the rooms are air-conditioned. 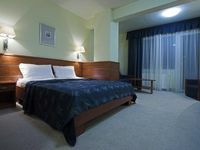 Superior (****) room with a queen-size bed or separate beds, bathroom with shower, LCD tv, phone, minibar, Internet connection. Only non-smoking rooms. All the rooms are air-conditioned. Superior (****) room with a queen-size bed or separate beds, and an extra bed, bathroom with shower, LCD tv, phone, minibar, Internet connection. Only non-smoking rooms. All the rooms are air-conditioned. • Reservations can be cancelled free of charge up to 1 days prior to arrival until 14:00.